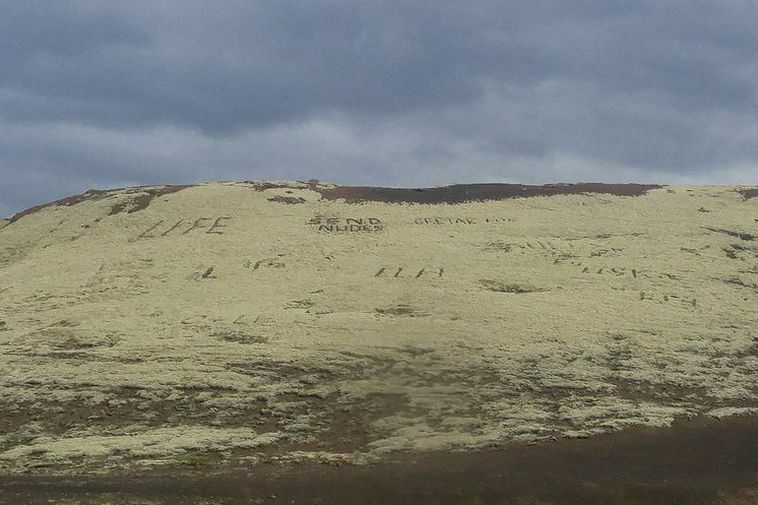 Over the last years people have been “writing” on a hill by Nesjavallaleið in South Iceland. They do this by tearing up the moss, which can easily take decades to grow back. Tour guide Gunnar Birgisson has had enough of this and calls for the vegetation to be mended as best it can. He also suggests that information will be made available on how to fix this, so people can do it when they happen upon it. That can prevent herd mentality kicking in and more people vandalising. He points out that this vandalism has been increasing. The words ‘Grétar Þór’, ‘Ég elska þig’ and ‘Elli’ have been there for a while, but last year the word ‘LIFE’ had been added in huge letters, and only recently the phrase “send nudes”. Birgisson believes the herd mentality is strong in people, and it‘s more difficult for tourists who aren't familiar with the discussion on nature conservation in Iceland. He mentions off road driving, which is illegal. „If one cars drives on and there are tracks, others believe it‘s ok”. Some of the phrases are in Icelandic and some of the names are Icelandic. It’s clear that though some of the vandalisers are might be tourists, some of them are definitely Icelandic. He says it‘s important to do something before vandalism becomes a trend, that one person can easily inspire a thousand people to do something, even though it‘s not right. Birgisson think it’s shocking how many people don’t respect nature. He mentions a Chinese tourist he met recently who was pooping outside and didn’t see anything wrong with leaving the toilet paper. It was not the first scenario of this kind he had witnessed.